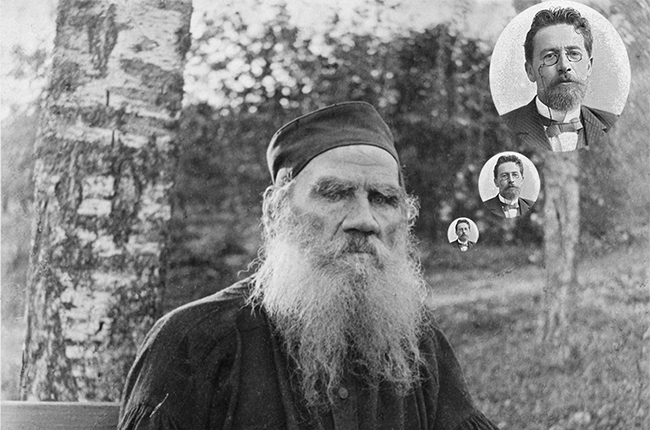 Tolstoy, Chekhov, Dostoyevsky, Bunin... We know what they thought about love, nature and Russia. But what did they think about each other? RBTH has put together quotes that writers and poets born in Russia said about their peers - both complimentary and disparaging. We present our interactive map to learn more about what Russian authors wrote about each other in their letters and journals. "You don't have two kopecks to your name, so you'd better go sober up and stop breathing your messianic hooch on me"
"What can you say about Mayakovsky? He can write, there is no doubt about that, but is it really poetry? His writing lacks order and is crowded with competing ideas. Poetry should bring order to life, but Mayakovsky's work reminds one of the scene after an earthquake? and everything in it has such sharp corners that it pains the eye." "Alexander Blok's works are an entire poetic era - a recent era. He was a great symbolist master who had a huge influence on all modern poetry. Some still cannot free themselves from the web of his mesmerizing lines... Others... are breaking the foundations of new rhythms, heaping up boulders of new images, linking lines with new rhymes - they are undertaking heroic labor that is creating the poetry of the future. Yet both sides remember Blok with equal fondness." "I often think that everything is alright, everything is still simple and not as scary as it could be while Lev Nikolayevich Tolstoy is still with us... While Tolstoy is alive, walking the furrow behind the plow being pulled by his white horse, the morning are dewy and fresh, and not scary, and ghouls are sleeping - and thank God for that. When Tolstoy walks this Earth, it is like the Sun shines on us. But if the Sun sets, if Tolstoy dies, if the last genius leaves us - what then?" "Of most importance was that he was always sincere, which is a great thing for a writer; and thanks to his sincerity Chekhov created new, totally new forms of writing." "I think Gorky is a genuine talent; his brushes and colors are all real, but he has a somewhat unrestrained, devil-may-care talent." "Take Bunin out of Russian literature and it will become dimmer, will lose the iridescent gleam and starry radiance of his wandering soul." "What s swindler and windbag (and often inarticulate at that)." "Dostoyevsky's lack of taste, his monotonous dealings with people suffering from pre-Freudian neuroses, his way of wallowing in the tragic misadventures of human dignity - all this is difficult to admire. I do not like this trick his characters have of 'sinning their way to Jesus' or, as Bunin put it more bluntly, 'spilling Jesus all over the place'." "Turgenev lacks knowledge of Russian life in general. He learned about the lives of ordinary people from a serf footman he went hunting with once (A Sportsman's Sketches), and beyond that he knew nothing"; <...>"He is someone who is happy to crawl from Baden to Karlsruhe on his hands and knees just to do something unpleasant to his literary rival..."
"When a person is in love, his heart beats fast; when he is angry, his face goes red, etc. These are all truisms. With Dostoyevsky, everything is the other way round. For example, a man sees a lion. What does he do? Naturally, he will go pale and try to flee or hide. In any simple story, by Jules Verne, say, this is exactly what would happen. Whereas Dostoyevsky would write the opposite: the man went red in the face and remained where he was. It would be an inverse truism... And then, on every other page Dostoyevsky's characters are either delirious, raving, or in a fever. But 'life is not like that'." "Anna Karenina is a work of literary perfection with absolutely spot-on timing and no equal in modern European literature. Secondly, in terms of its ideas, it is something of ours, something innately Russian..."